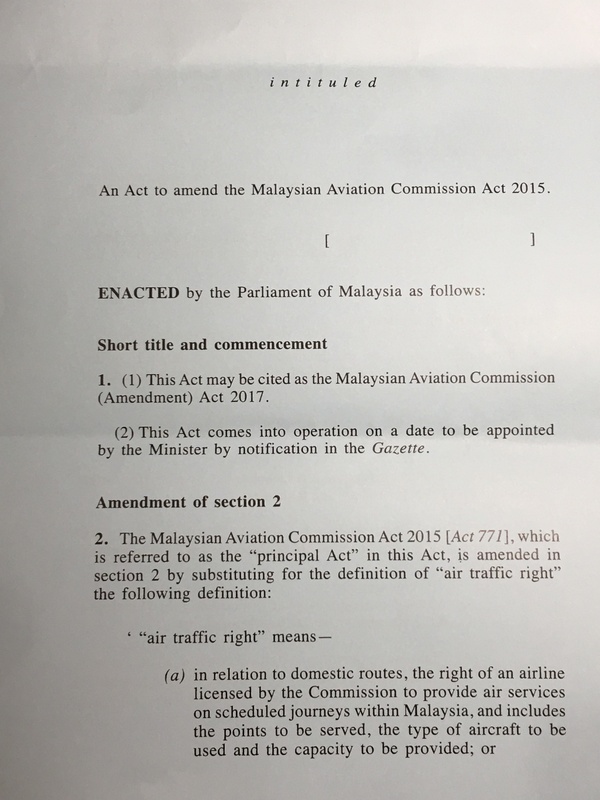 Today the Government has tabled a Bill in Parliament to amend the Malaysian Aviation Commission Act 2015 (MAVCOM) to give more power to MAVCOM to regulate unfair practices of all airlines flying out from Malaysia. More importantly, “The Bill also seeks to ensure that that the Commission will continuously have sufficient financial resources for protecting the rights and interest of the consumers and the development of the aviation industry in Malaysia.”. The introduction of this Bill is very timely in order to put an end to the power of airlines from imposing unfair charges, which are contrary to the interest of the travelling public/consumers. Yours truly believes that airlines could still impose charges and fees but after the passing of this Bill they will have to justify each and every proposed charges to MAVCOM that its new charges are fair. All Malaysians should welcome this Bill as it is set out to protect the interest of the travelling public/consumers and is good for the development of the aviation industry in Malaysia. Malaysia badly needed this Bill be passed soon to stop airlines from arbitrarily imposing unfair charges and fees. It must be noted that more often than not that the consumers are in the position of inequality of bargaining power and in certain cases they have no alternative but to travel on certain airlines to the intended destination. It is high time the Government should put into motion more of such consumer protection legislations to be passed by Parliament to promote an orderly market that protect the interest of the consumers generally. It is an open secret that an airline threw a special lunch briefing on the Bill for the opposition MPs. Such practice should be encouraged and open to all MPs to attend so that the Bill could be properly debated in the best interest of the nation. It is overdue for the govt to regulate and stop the hidden charges imposed by airlines. They are too many charges on top of the actual fare. If you go to the website of airline, your fare may be RM500 and you have to pay for food, check in baggage, seat and etc. The total may cost you more than RM700 in total. Soon they will also impose fees for using the toilet or breathing the air in the aircraft. MAVCOM must stop this nonsense. Make sure that all airlines have to advertise their all in fare. The current trend of add on costs are unacceptable. I wonder which airline gave the lunch meeting to MPs. Why is the airline so interested? Worried that they cannot have hidden charges after this Bill is passed!